Common side effects depend on the formulation of nicotine. Common side effects with the gum include nausea, hiccups, and irritation of the mouth. Common side effects with the patch include skin irritation and a dry mouth while the inhaler commonly results in a cough, runny nose, or headaches. Serious risks include nicotine poisoning and continued addiction. They do not appear to increase the risk of heart attacks. There are possible harms to the baby if used during pregnancy. Nicotine replacement therapy works by reducing cravings due to nicotine addiction. They were first approved for use in the United States in 1984. Nicotine replacement products are on the WHO Model List of Essential Medicines, the most important medication needed in a basic health system. They are available as generic medication. In the United States a month of patches or gum is between 100 and 200 USD while the other forms are more expensive. Nicotine replacement therapy, in the form of gum, patches, nasal spray, inhaler and lozenges all improve the ability of people trying to quit tobacco products. Studies have shown that nicotine replacement therapy is equally as effective as medications such as bupropion, in helping people quit smoking for at least 6 months. Studies have also shown that each form of nicotine replacement therapy, including nicotine gum, patches, nasal spray, inhalers, and lozenges have similar success rates in terms of helping people stop smoking. However, the likelihood that someone will stick to a certain treatment varied, with compliance being the highest with nicotine patches, followed by nicotine gum, inhalers, and nasal sprays. It is important to note that using a few different nicotine replacement methods in combination may improve one's success rates in stopping tobacco use. Additionally, using nicotine replacement with counseling has been proven to improve tobacco abstinence rates. Nicotine replacement products are most beneficial for heavy smokers who smoke more than 15 cigarettes per day. There are not enough studies to show that NRT helps those who smoke fewer than 10 cigarettes per day. While there is no evidence that NRT can increase the risk of heart attacks, individuals with pre-existing cardiovascular conditions or recent heart attacks should consult a physician before initiating NRT. If you are under 18 years of age, you should consult your physician before starting NRT. Nicotine exposure during pregnancy can result in attention deficit hyperactivity disorder (ADHD) and learning disabilities in the child. It also puts the child at risk for nicotine addiction in the future. Thus, pregnant women and those who are breastfeeding should also consult a physician before initiating NRT. The gum, lozenge, and nasal spray are pregnancy category C. The transdermal patch is pregnancy category D. The transdermal patch is considered less safe for the fetus because it delivers continuous nicotine exposure as opposed to the gum or lozenge, which delivers intermittent and thus lower nicotine exposure. Limited evidence exists regarding long-term NRT use, and concerns exist that long-term NRT use could raise cancer risk, due in part to the generation of carcinogens. Nicotine replacement products vary in the time it takes for the nicotine to enter the body and the total time nicotine stays in the body. Nicotine patches are applied to the skin and continuously administer a stable dose of nicotine slowly over 16–24 hours. Nicotine gum, nicotine sprays, nicotine sublingual tablets, and nicotine lozenges administer nicotine orally with quicker nicotine uptake into the body, but lasting a shorter amount of time. Nicotine inhalers are metered-dose inhalers that administer nicotine through the lungs and mucous membranes of the throat quickly, but lasting a short amount of time. For example, blood nicotine levels are the highest 5–10 minutes after using the nicotine nasal spray, 20 minutes after using a nicotine inhaler or chewing nicotine gum, and 2–4 hours after using a nicotine patch. In the United States a month of patches or gum is between 100 and 200 USD while the other forms are more expensive; in the UK lozenges are the cheapest. In the United States a month of patches is about 170 USD. Evaluation of NRT in real-world studies produces more modest outcomes than efficacy studies conducted by the industry-funded trials. The National Health Service (NHS) in England has a smoking cessation service based on pharmacotherapy in combination with counseling support. An Action on Smoking and Health (UK) (ASH) report claims that the average cost per life year gained for every smoker successfully treated by these services is less than £1,000 (below the NICE guidelines of £20,000 per QALY (quality-adjusted life year). However, the investment in NHS stop smoking services is relatively low. A comparison with treatment costs for illicit drug users shows that £585 million is committed for 350,000 problem drug users compared to £56 million for 9 million users of tobacco. This is £6.20 for each smoker, compared to £1,670 per illegal drug user. The claims for high efficacy and cost-effectiveness of NRT have not been substantiated in real-world effectiveness studies. Pierce and Gilpin (2002) stated their conclusion as follows: “Since becoming available over the counter, NRT appears no longer effective in increasing long-term successful cessation” (p. 1260). Efficacy studies, which are conducted using randomized controlled trials, do not transfer very well to real-world effectiveness. Bauld, Bell, McCullough, Richardson and Greaves (2009) reviewed 20 studies on the effectiveness of intensive NHS treatments for smoking cessation published between 1990 and 2007. Quit rates showed a dramatic decrease between 4-weeks and one year. A quit rate of 53% at four weeks fell to only 15% at 1 year. Younger smokers, females, pregnant smokers and more deprived smokers had lower quit rates than other groups. In 2015, NRT sales fell for the first time since 2008 while sales for e-cigarettes continued to increase at a substantial rate. This had led to speculation that UK smokers are trying to quit with e-cigarettes rather than traditional, pharma-backed NRT methods. The United States Public Health Service lists seven agents for the stopping of tobacco, which include 5 nicotine replacement treatments (nicotine patches, gum, lozenges, inhalers, and nasal sprays) and 2 oral medications (bupropion and varenicline). Other NRT options are available, including nicotine mouth sprays and sublingual tablets. Trade names include Nicotex, Nicorette, Nicoderm, Nicogum, Nicotinell, Thrive and Commit Lozenge. Snus and nasal snuff also allow for nicotine administration outside of tobacco smoking, but do cause negative health effects. E-cigarettes are often, although not always, designed to look and feel like cigarettes. 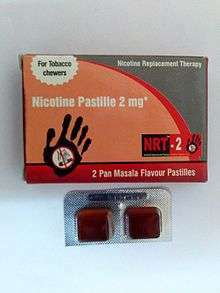 They have been marketed as less harmful alternatives to cigarettes, but very few are as yet approved as NRTs in any jurisdiction. Some electronic cigarettes have coarsely adjustable nicotine levels. Some healthcare groups have hesitated to recommend e-cigarettes for quitting smoking, because of limited evidence of effectiveness and safety. The U.S. Food and Drug Administration (FDA) has a list of additional tobacco products they are seeking to regulate, including electronic cigarettes. The evidence suggests that the FDA accepted products such as a nicotine inhaler may be a safer way to give nicotine than e-cigarettes. ↑ Jain, R; Majumder, P; Gupta, T (2013). "Pharmacological intervention of nicotine dependence.". BioMed research international. 2013: 278392. doi:10.1155/2013/278392. PMC 3891736 . PMID 24490153. 1 2 3 4 Stead, LF; Perera, R; Bullen, C; Mant, D; Hartmann-Boyce, J; Cahill, K; Lancaster, T (Nov 14, 2012). Stead, Lindsay F, ed. "Nicotine replacement therapy for smoking cessation". The Cochrane database of systematic reviews. 11: CD000146. doi:10.1002/14651858.CD000146.pub4. PMID 23152200. 1 2 Hamilton, Richart (2015). Tarascon Pocket Pharmacopoeia 2015 Deluxe Lab-Coat Edition. Jones & Bartlett Learning. p. 441. ISBN 9781284057560. 1 2 Cahill, K; Stevens, S; Perera, R; Lancaster, T (2013). "Pharmacological interventions for smoking cessation: an overview and network meta-analysis.". The Cochrane database of systematic reviews. 5: CD009329. doi:10.1002/14651858.CD009329.pub2. PMID 23728690. ↑ Hajek, Peter; West, Robert; Foulds, Jonathan; Nilsson, Fredrik; Burrows, Sylvia; Meadow, Anna. "Randomized Comparative Trial of Nicotine Polacrilex, a Transdermal Patch, Nasal Spray, and an Inhaler". Archives of Internal Medicine. 159 (17): 2033. doi:10.1001/archinte.159.17.2033. 1 2 3 4 Rigotti, NA (Feb 2002). "Clinical practice. Treatment of tobacco use and dependence.". The New England Journal of Medicine. 346 (7): 506–12. doi:10.1056/nejmcp012279. PMID 11844853. ↑ "Nicotine replacement therapy". MedlinePlus. U.S. National Library of Medicine. Retrieved 28 October 2014. 1 2 3 "FDA 101: Smoking Cessation Products". U.S. Food and Drug Administration. Retrieved 28 October 2014. 1 2 Bruin, Jennifer; Gerstein, Hertzel; Holloway, Alison (2 April 2010). "Long-Term Consequences of Fetal and Neonatal Nicotine Exposure: A Critical Review". Toxicological Sciences. 116 (2): 364–374. doi:10.1093/toxsci/kfq103. ↑ Wilder, Natalie; Daley, Claire; Sugarman, Jane; Partridge, James (April 2016). "Nicotine without smoke: Tobacco harm reduction". UK: Royal College of Physicians. p. 58. ↑ "Action on Smoking & Health, 2008" (PDF). Retrieved 27 August 2015. ↑ Bauld; et al. (2010). "The effectiveness of NHS smoking cessation services: a systematic review.". J Public Health (Oxf). 32: 71–82. doi:10.1093/pubmed/fdp074. PMID 19638397. ↑ "E-cigarettes Spark Nicotine Replacement Therapy Mutiny". Newswire. 2015-07-29. Retrieved 2015-10-01. ↑ Phillips, CV; Heavner, KK (2009). "Smokeless tobacco: The epidemiology and politics of harm". Biomarkers. 14 (Suppl 1): 79–84. doi:10.1080/13547500902965476. PMID 19604065. ↑ "Electronic cigarettes (also known as vapourisers)" (PDF). Action on Smoking and Health. Retrieved 10 November 2014. ↑ Drummond, MB; Upson, D (February 2014). "Electronic cigarettes. Potential harms and benefits.". Annals of the American Thoracic Society. 11 (2): 236–42. doi:10.1513/annalsats.201311-391fr. PMID 24575993.